Born in Montrose, Scotland in 1773, Robert Brown made his mark as a scientist in botany and palaeobotany. He is most famously known for his discovery of Brownian motion which came through his use of microscopy to investigate pollen grains in water. Robert Brown is also one of the most significant collectors of plants in Australia. Arriving in Australia in 1801 Brown and his colleagues then spent the next four years travelling around Australia and making substantial numbers of herbarium, seed, mineral and zoological collections. The importance of Brown’s collections has long been recognised, but there are difficulties in the correct recognition and selection of the type specimens within the collection. This has partly come about by the existence of several sets of specimens in various institutes of which only some have been annotated with the number series of JJ Bennett who was Brown’s successor. There is a real need to make Robert Brown’s specimens available to taxonomists in order to resolve the considerable confusion over the typification. The Investigator sailed from Spithead on the 18th July 1801, embarking on a major expedition to carry out a coastal survey of Australia and neighbouring islands. Joseph Banks, at that time the President of the Royal Society, was a patron of the expedition and hugely influential in its planning. He had first invited Mungo Park to go to Australia but Park turned it down. Later, with the planning of Flinders’s Investigator voyage, Banks turned to Robert Brown who at that time was an army surgeon in the Fifeshire Fencibles regiment, based in Ireland. The ship reached Australia in December 1801, and Brown began collecting at once. Between 1802 and 1805, Brown managed to send back some batches of specimens by ship to Joseph Banks in London. One of these ships, the Porpoise, was wrecked in 1803 on the North coast of Australia with no loss of life, but Brown’s specimens were lost. These early batches of specimens received by Banks were eventually laid into Banks’s Herbarium, now in the Natural History Museum London, by Jonas Dryander, Banks’ librarian. They have Dryander’s handwriting on the labels and little information. On the ship’s return in October 1805, a total of 38 cases of natural history specimens and drawings were unloaded. They held an additional 4,000 or so dried plant specimens. These were taken to Banks’ house in Soho Square but Brown worked on his own set for his publications. Robert Brown, meanwhile, took the post of Librarian of the Linnean Society of London in 1806. Following the death of Jonas Dryander in 1810, Brown became Banks’ librarian, the same year that he published his Prodromus from the expedition. The bulk of Brown’s specimens remained at Banks’ house in Soho until 1827-28 when they were transferred to the British Museum in Bloomsbury, although they were still held separate from the main collections. In 1837, Robert Brown became the first Keeper of the Botanical Department at British Museum and continued in post until his death in 1858. During this time he continued to hold his personal Australian herbarium separate from the main collections, restricting general access. On Robert Brown’s death in 1858, his herbarium was left to Joseph J. Bennett. It remained as a whole until Bennett’s death in 1876, at which time it was divided according to his directions into sets for distribution. The first set of about 3,900 specimens was incorporated into the main collections of the British Museum, then moved to what is now the Natural History Museum. 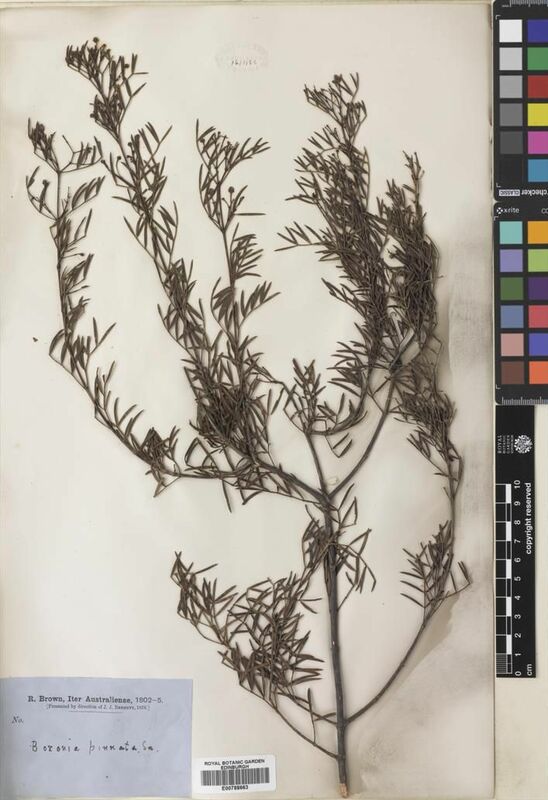 The accession book at RBGE states that several batches of Robert Brown specimens received from Kew were accessioned between 1878 and 1882 so it seems that at some sets were then sent to Kew by the British Museum for distribution. Kew retained the second set and the specimens sent to RBGE are considered to be the third set. 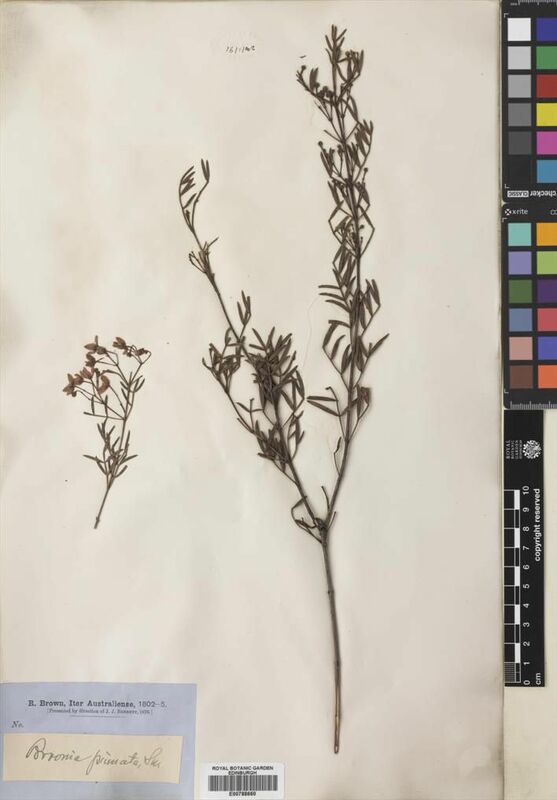 Smaller sets of duplicates were sent to various other herbaria, including the Thunberg herbarium (UPS), Geneva (G) and Paris (P), but Brown himself had already distributed many specimens to such institutions in his own lifetime. 23 May 1881 Kew Herbarium 17 packages of duplicates of Robert Browns Australian Herbarium presented at request of J.H. [sic] Bennett Esq. 21 July 1881 Kew Herbarium 7 packages of duplicates of Robert Brown’s Australian collection, presented J Bennett Esq. 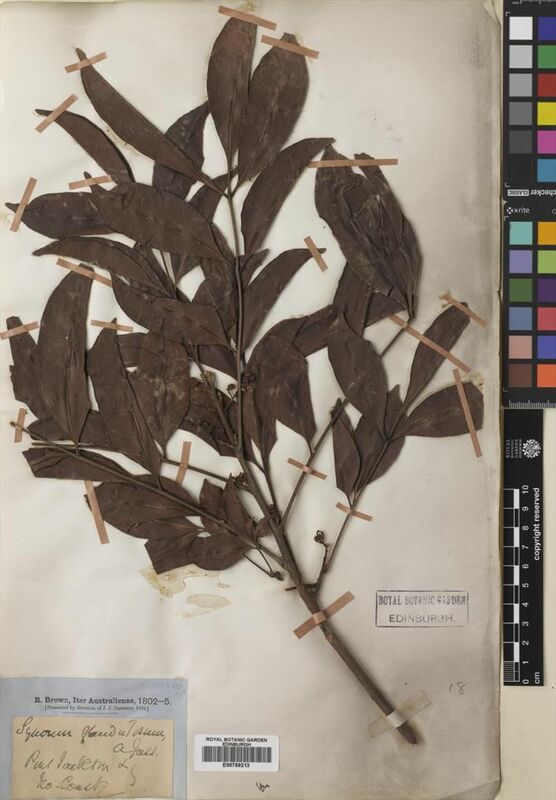 The Robert Brown specimens collected in Australia held at RBGE have now been completely digitised. This, whilst it gives us more information about the collections held here, also raises many more questions about the actual specimens and the potential for the collections to comprise multiple sets. There are 5,432 specimens which have been identified so far as being collected by Robert Brown in Australia. Of these, 2,277 have Bennett numbers on the labels. These labels are standard blue labels bearing the heading “R. Brown Iter Australiense, 1802-5” below which reads (Presented by direction of J.J. Bennett, 1876). The name of the species along with any collection information is handwritten directly onto the label. Of the 2,277 specimens with numbers, there are 2,012 unique numbers, whilst 228 Bennett numbers have at least two specimens. One Bennett number has as many as five specimens held at RBGE. 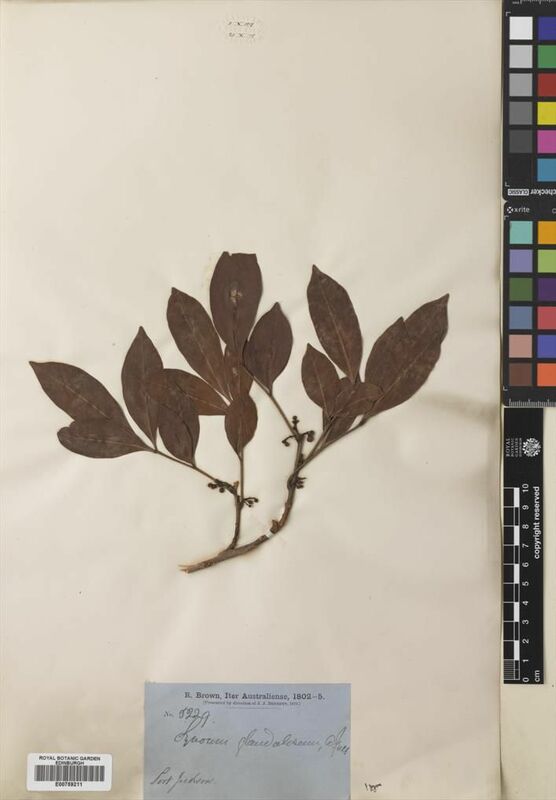 This leaves 3,155 specimens with no numbers. Of these, the vast majority have the same standard blue label but in most cases the information is handwritten onto paper slips which have then been pasted onto the labels. A preliminary survey of the specimens looking particularly at differences in labels, label information and handwriting has produced some interesting results. There are several different formats held at RBGE and examples of thes e are presented below. The specimen on the left shows the number and information written directly onto the blue label. The one on the right shows the handwritten slip pasted onto the label and no number present. The following specimen for the same species has just the species name in an as yet unidentified handwriting. In the examples below, there are two specimens where the information has been handwritten directly onto the labels but only one of these has a Bennett number. The third specimen has the slip pasted onto the blue label. There are also a small number of specimens which do not have the standard blue labels. Of these, some have no label. The example shown below left has a slip with “No. 4” and an annotation in pencil saying “Probably R. Brown, Iter Austr.”. 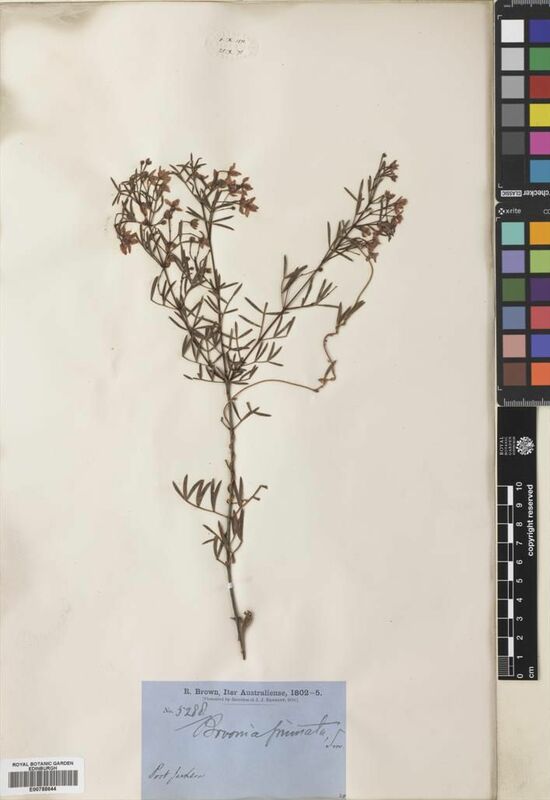 The example below right has a blue label but this label does not relate directly to J. J. Bennetts distribution in 1876 and this may have come directly from the British Museum either before or after 1876, rather than via Kew. 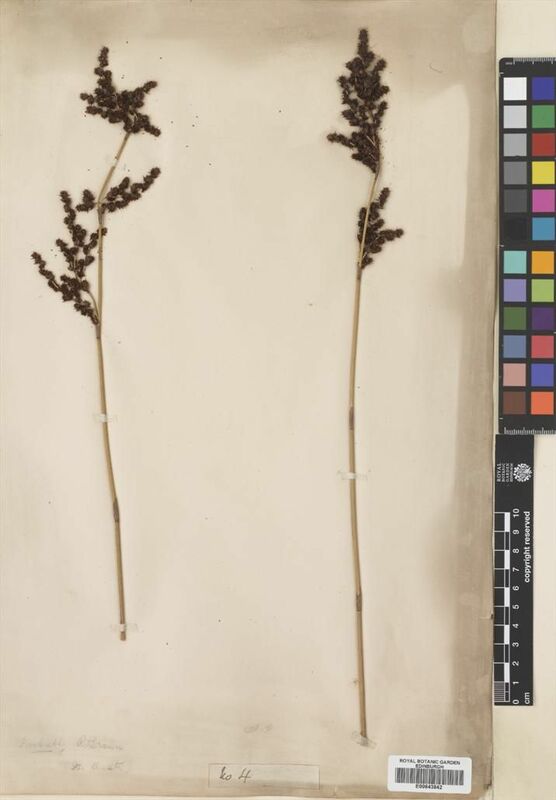 This indicates that there are potentially four or more sets or partial sets of Robert Brown specimens held at RBGE. Given the history of the RBGE Herbarium there is good justification for at least two sets being held. The Herbarium of the Royal Botanic Garden Edinburgh is founded from two major herbaria in Scotland. The Botanical Society of Edinburgh was founded in 1836 and included the formation of a herbarium. By 1839, only three years later, the Herbarium comprised 150,000 specimens including a large number collected outside Britain. Some Brown specimens may well have been received at this time. In 1838, the Botanical Society of Edinburgh Herbarium was transferred into more spacious accommodation at the University of Edinburgh, at the same time incorporating the University Herbarium. In 1863, space again forced a move of the Herbarium and it was then moved to the Royal Botanic Garden. Many of the Brown specimens held at RBGE, have the stamp of the Edinburgh University Herbarium, often with the date of receipt and accession. 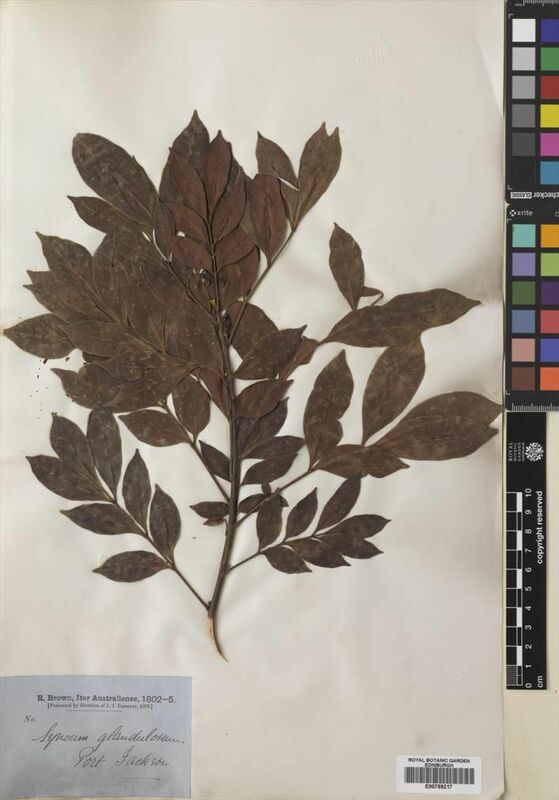 In 1942, a large part of the Herbarium of Glasgow University was received on permanent loan. The rest of the Herbarium (excluding the British flowering plants) was received later. This Herbarium was a large and important collection, and was formed principally by Walker Arnott. It is possible that some of the specimens without the standard blue labels would have come with the Glasgow Herbarium. 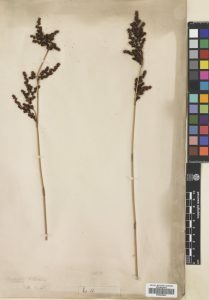 When the Brown specimens were distributed following Bennett’s death, it was mistakenly believed that the Bennett numbers referred to individual collections and that there were therefore clear duplicates for distribution. 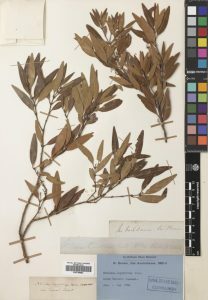 However, the Bennett numbers are now understood to refer to species rather than collections and thus many of the ‘duplicates’ distributed to other herbaria many actually be separate collections. This confusion is increased following the survey of specimens at RBGE where there are several specimens with the same species name but with a different Bennett number. These specimens are all labelled as Chrysocephalum semipapposum but bear the following numbers: 2184, 2185, 2186 and 2189. 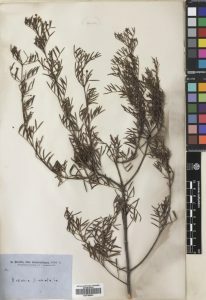 Following the specimens’ arrival at RBGE, there is evidence of some parts of some specimens being sent on as duplicates as well as some specimens originally mounted on a single sheet being separated, the herbarium sheet being actually cut to separate the material, and sent to J. H. Maiden (Sydney) in 1900 for study. 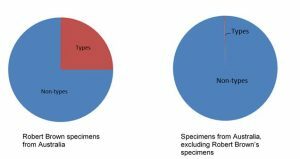 On carrying out some preliminary analyses of the Robert Brown specimens at RBGE we found that there are an astonishingly high percentage of type specimens – a quarter of the total number of specimens collected by him and held at RBGE are types. This contrasts strongly with the percentage of types excluding the Brown specimens, totalling 1.6% of the collections.